Warhammer World Trip: 7th edition Mini-Tournament! 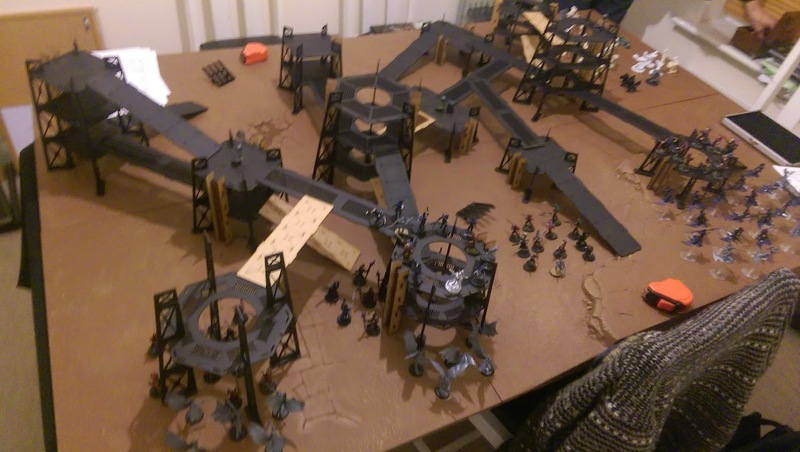 DW’s friend Wiggy was up from the South to pay a visit to Warhammer World, so we took the opportunity to make it a day for a 3-person mini-tournament! We only had 8 hours to get in 3 games. Each one of us would play twice, playing everyone in round-robin fashion. We used the Maelstrom of War missions (using the Tactical Objectives), rolling randomly to decide the mission. The first two players were decided by rolling a die, with Wiggy and David playing first. Frank got to sit and see Wiggy’s Mechanicum force in action! The overall winner would be decided by the total of Victory Points earned in every game!! 7th Edition: Space Wolves v Tyranids! DW’s first 7th edition game, facing a Tyranid horde! WHO WILL WIN?! Yes! We are re-branding and updating a bit, the new site (with 99% of the same content) is here: http://www.tabletopwarlords.com/ There’s a few new things coming, so head on over to the new site and stay tuned for some cool new announcements! February 13, 2015 in Upcoming. January 7, 2015 in Painted. December 9, 2014 in Just Kinda Cool. June 24, 2014 in Tyranids, Work in Progress. More for the Hive Fleet! 60 more for the Hive Fleet Eviscera horde! June 14, 2014 in Painted, Tyranids, Warhammer 40K.